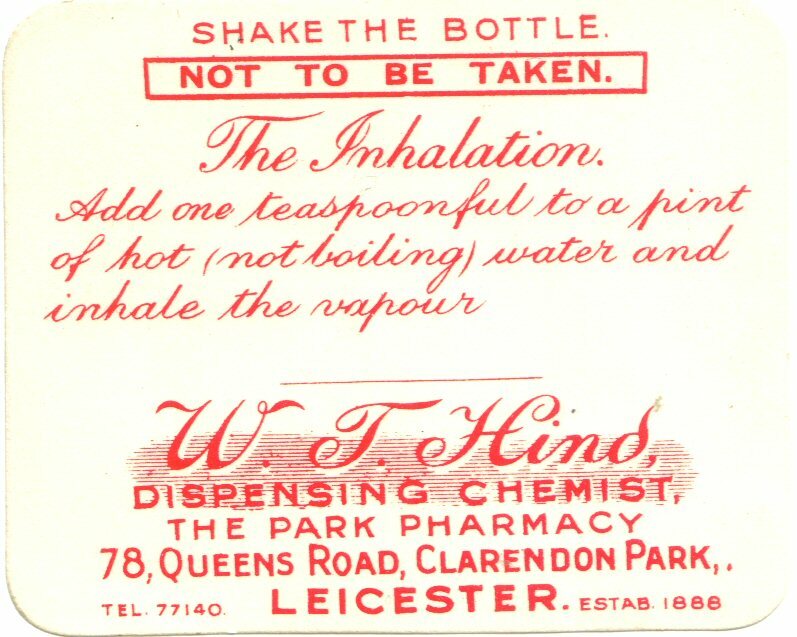 This entry was posted in Uncategorized and tagged Chemists, Clarendon Park, Family history, Genealogy, History, House history, Leicester, Local history, Old, Old advertisements, Pharmacy, Victorians. Bookmark the permalink. Great photos, as a one time bottle collector and descendant of a family of chemists and druggists, I love these old bottles. 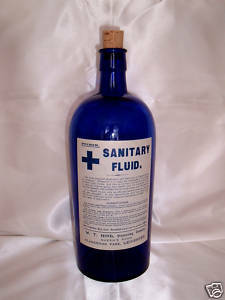 Did you see Victorian Pharmacy when it was on earlier this year? No I missed it and was very annoyed about it. There are a few chemists in my husband’s family too…it’s a fascinating trade. I am looking forward to having a look at the prescription books for W T Hind at Leicestershire Records Office as soon as it re-opens. I remember WT Hind’s well. In the early 1970s I was an amateur chemist (I was still at school: these days I do chemistry for a living). They allowed me to order quickfit glassware and various chemicals for carrying out experiments in my garage. I was even able to order a can of sodium metal from them (it was part of my Christmas list in about 1975). My mother rode back into Leicester on her moped (preumably not wishing to put bus passengers at risk) to return it to them once she found what I was doing with it. I can’t imagine anyone being allowed to buy something like this these days. I just had to look up sodium metal (not being a chemist) and I can see why you wanted to get hold of some – it looks like cool but dangerous stuff! How interesting that WT Hind’s helped you on your way to a career in chemistry. Did you live in Clarendon Park or did you use Hind’s because of their willingness to supply you with exlosives? Sorry about the delay in replying: I don’t check back here often. No, I lived in Glenfield. I can’t remember how I came across WT Hinds: but I do remember they had a fisons catalogue which listed quickfit apparatus. Perhaps I called in there on the off-chance they could help me. I needed all-glass apparatus for another experiment I did: preparation of concentrated nitric acid. Nitric acid is a strong oxidizing agent so rubber bungs would just dissolve. Hinds wouldn’t sell me concentrated sulphuric acid (I can’t think why!) so I ordered the dilute stuff and boiled it down to concentrate it, testing it with a piece of newspaper, which turns black once it is concentrated. I also needed potassium nitrate (one of the ingredients of gunpowder), and I got a kilogram of that from Boots the chemists, who also sold me flowers of sulphur without asking what it was for (gunpowder). I rigged up an all-glass distillation apparatus in the garage, running tubes connecting the condenser to the kitchen sink. The experiment was a success. There is absolutely no way I would be able to do anything like this today, which is a shame, since as you say, that is how I got started as a chemist. As I remember, I continued my amateur chemistry experiments until about the time I took my “O” levels. Then I became too busy. But they stood me in good stead: I gained a degree in chemistry from Oxford, a Ph.D. in chemistry from Manchester, and now work as a chemist for Dupont in the U.S.A. I still have a chemical balance and a tin full of “Merit” chemicals (purchased from Youngs of Belvoir street, which no longer seems to be there) in the loft at home in Glenfield. So, thank-you WT Hinds. Without your help, I would probably be an accountant! Thank you so much for your reply Mark.� What a wonderful story.� I’m surprised that the chemicals you ordered have such old fashioned, romantic sounding names – “flowers of sulphur” is especially lovely, I can’t imagine it being used for making gunpowder.� I’m torn by being sad that it isn’t possible today for a passionate young chemist to make gunpowder in his parents’ garage, and being grateful that it isn’t (I have two young boys myself).� It didn’t do you any harm anyway! I worked at Hind’s pharmacy on Queens Road when I first qualified as a pharmacist in 1994. 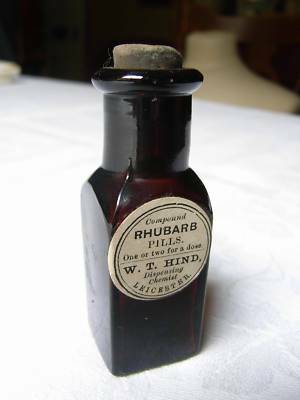 I am fairly confident that Hind’s pharmacy became part of E.Moss pharmacy group at this time. As a young pharmacist with an interest in old pharmacy, I loved working there every Friday. There was a basement with quite a few old pharmacy bottles in it and an attic with some really interesting old pharmacy record books in it too. You got a sense that this was a very well known, respected and interesting pharmacy over the years and I always wished that I had seen it 20-30 years prior to when I did. Good times working with Kevin the pharmacy assistant there. I have a whole album full of WT Hinds labels like the one you posted.